The Asheville Symphony’s The Asheville Symphony Sessions is quite the undertaking. Featuring the ASO and some of western North Carolina’s most beloved musicians, the album opens with a funky “Filthy Dirty South” from Rising Appalachia. Although this song does indeed have string swirls in it, it is more the unique harmonies of Chloe and Leah Smith that brings the tune to life. The meld of voices here is just on the cusp of being atonal actually, which makes this opener even more enticing, as everything certainly works to a razor edge precision. Ben Lovett’s wonderfully warm pipes, his toy piano playing, and the Children’s Ensemble from the Academy for the Arts at First Baptist Church of Asheville give the jumpy chant of “Don’t Freak Out” its groove, while Lizz Wright leads Free Planet Radio (with wonderful funk drumming from River Guerguerian) on a perfectly MOR commercial hit “Circle Round the Flame.” It’s another tune that does not really need the small amount of strings we slightly hear here. Electric Owls’ “Pontiac” opens with a big orchestra, which slips in during the chorus, in this tune led by Andy Herod’s almost Eric Stewart “I’m Not In Love”-like vocals and Marcel Anton’s crying guitar wail. 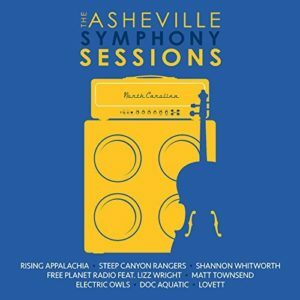 The ASO doesn’t so much intrude here and often times I am not sure they are even needed as this group of Asheville’s finest rock/pop players certainly steps up to the plate on The Asheville Symphony Sessions.